Happy Tuesday! I'm a day late for our Foodie Freebie this week so my apologies. I haven't been feeling well and it's been challenging to post these days. I hope you can bare with me and hopefully I'll be back to my normal self soon. So let's just jump in and find out what I'm giving away this week! With the holidays fast approaching, a dessert I look forward to enjoying is pie. It seems pie is a popular treat this time of year. 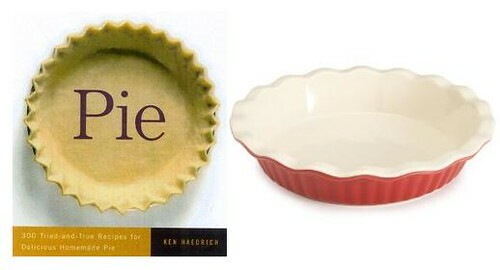 I'd love to help a reader have some memorable pie this year with this week's giveaway - a beautiful 9 inch pie plate and a great pie cookbook filled with 300 tried and true pie recipes! - What is your favorite kind of pie? Deadline: Thursday, November 12, 2009 at 12 midnight CST. ONE WINNER will be randomly chosen by Random. Org's Interger Generator based on the number of your comment and will be announced on Friday, November 13, 2009. Good luck! My absolute favorite pie is the traditional deep dish apple pie served warm with a scoop of vanilla ice cream... heaven on a plate. 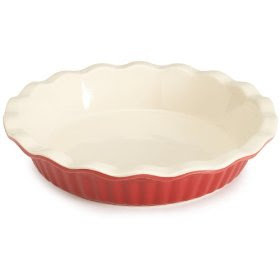 OMG - I am in so desperate need of a pie plate! My favorite is either pumpkin pie or shoo fly pie (a Pennsylvania Dutch favorite!). My favorite kind of pie depends on the time of year. Apple pie in the spring/summer and pumpkin pie in the fall/winter...both with a big old scoop of vanilla ice cream! 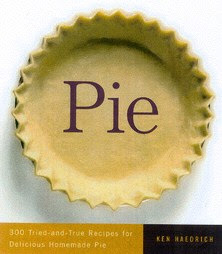 My favorite pie is probably apple pie, although mixed berry takes a VERY close second place. Sweet potato pie is my favorite!! My favorite would have to be pecan. It brings back a lot of childhood memories... sharing a big slice of pie with my Dad during the holidays! Yum! What a great giveaway! My favorite pie is definitely peach...no contest. I have two! Strawberry rhubarb & Pecan! My favorite pie is Grasshopper, followed closely by pecan. I absolutely love pie! My faves are sweet potato, pumpkin and apple crumb. I would like to make a cherry crumb one. Maybe I can if I win this! My favorite is triple layer mud pie! It looks impressive, and it's so easy to make. Not to mention the fact that it's so yummy! I love dutch apple pie but a close second is peanut butter pie. There are two that I really love. Banana cream and peach, yum! Maybe I'll make a peach pie this weekend! No contest: my dad's butterscotch pecan pie. I didn't even start eating pecan pie until I was in my early 20's. I'm sorry to have missed out on it for so long! I love a family recipe chocolate silk pie that we call "Pat's Pie," but I've recently really fallen in love with pumpkin pie. We love pie in this household! I can't get enough all American apple pie! I love pecan pie. It's definitely my favorite! Yummy - I love pie, especially apple and pumpkin! There is nothing better than a perfect pecan pie with whipped cream on top! Pumpkin pie at this time of the year. Peanut Butter Pie is a favorite any time of the year. Pumpkin apple pie, oh yum! Cherry is my absolute favorite! My grandma made it the best. Apple pie!! I made the best deep dish apple pie a few weeks ago. Now my husband and I are obsessed with apples! Too many to count, mostly fruit pies. But I love cherry the most. Feel better soon J! I am in LOVE with that color on the pie plate. Warm apple pie with vanilla ice cream! Dutch apple with a crumb topping and home made vanilla ice cream. I could probably eat the whole thing by myself. One pie? That is hard to pick, sweets are my weakness. Huummmm, I guess I will go with cherry. OMG I have a deep need for a real pie plate! I heart berry pies of all varieties. One of my all time favorites has to be a chocolate pecan pie that my husband's aunt makes. It is SO good! My favorite pie is just classic apple. I have it for my birthday 'cake' every year! I love the classic apple pie and ice cream! Apple Pie a la mode for me! With plenty of cinnamon sprinkled on top. it's a tie between banana cream and blueberry! please don't make me choose! I love apple pie, especially with a scoop of vanilla ice cream on top. Coconut Cream, Lemon Meringue and Pecan are my top three! Yum! Chocolate chip cookie dough pie. Heavenly!!! I recently discovered your blog, it's great! I'd love that pie plate! I don't have one and have been really wanting one. My favorite pie is pumpkin pie. This means I'm super excited about this time of year! I guess I have two— Chocolate Silk (I love to eat), and Pumpkin (I love to make). Apple crumb is my favorite, but I would love to start experimenting some more with "unusual" kinds. I used to say I liked any kind of pie but pumpkin and lemon meringue. Then my mother-in-law served 3 kinds of pie for Thanksgiving. Pecan, Coconut Cream and Pumpkin. Eek! I don't like nuts or coconut, so I was up a creek without a paddle. Now I say I like any but those four. Its a toss up between cherry and pumpkin. Sweet Potato or coconut cream! Blueberry - Yum! Now I'm going to have to bake a pie soon. My favorite is simple apple pie or Buttermilk. Yummy! I have only made a few pies in my day. This is something I need to work on. Sweet potato and any kind with chocolate are my favorite! My absolute favorite is Dutch Apple. I am wild about streusel topping. I would have to say French Silk Pie. Yummy! I love, love, LOVE blueberry pie! My absolute fave! Runner up is sweet potato pie. I particularly like a pie that has the combination of sweet and savory - such as pears and garlicky goat and Gruyere cheese with peppery seasoning and plenty of love. Pumpkin Pie from scratch... my mom grows her own pumpkins so I am spoiled every year! Apple is the first one that comes to mind as a favorite, but every once in a while I love a slice of blueberry pie. Cherry Pie is my absolute favorite!! This is such a fun giveaway! I love banana cream pie and buttermilk pie with raspberry sauce and whipped cream. Yum! My favorite pie is peach, but some close seconds are blueberry and apple! My absolute favorite pie is caramel apple!! yum!! I love apple pie with the crumb topping...always reminds me of Thanksgiving no matter what time of the year I have it! My Grandma's Banana Cream Pie is the best! I love summer plum pie. My banana cream pie is so good! Apple is the only one I've made so far and it was delicious! My Mom's Banana Cream Pie! I love my grandma's apple pie, but I pretty much think you can't go wrong with any type of pie! I love pumpkin the best! Well.. Nana's Apple Pie is my FAVORITE... but she is no longer with us... and no one else's tastes like hers. And I hope you're feeling better!! dutch apple pie. with vanilla ice cream of course! Apple pie wins me over all the time. I love key lime pie. A good one is hard to find in NY. Oh, that's easy! Pecanless pie! YUM!!! I love peach blueberry pie and pecan pie, yum! Key Lime Pie! But blueberry is a close second. I am a Fairweather Johnson when it comes to pie! No way can I commit to just one. But since it is fall I will go with pumpkin. Has to be cherry pie. Which, coincidentally, would look fantastic in this pan! Thanks for another great giveaway! I love apple pie with ice cream! Pumpkin pie with a mountain of whipped cream is my favorite, followed closely by dutch apple and then cookie dough pie. Ok, so it's more of a 3 way tie, and now I want a slice of each!!!!! My favorite kind of pie is PECAN PIE. apple crumble w/ vanilla bean ice cream. hands down! Banana cream, or coconut cream. No wait cherry, peach, or apple. I can't decide- it's pie they are all good. I have fond memories of a peach blueberry pie. My grandmother made the best apple-tomato pie. Yum! A peach-blueberry pie brings back fond memories, but I have to say I really miss my grandmothers apple-tomato pie, sounds crazy but the best apple pie that I have ever had! It's honestly a toss-up between pecan pie and egg custard pie (but only my great-grandmother's recipe)... Yum! Caramel apple pie! With vanilla ice cream, of course. Graham Cracker Pie - it's basically just a plain cream/custard pie, but my grandmother made it best and there is no recipe! We are still trying to perfect it. My fave pie is pumpkin! My favorite pie is pecan pumpkin pie, because it combines two of my favorites! Apple is the best ever! My mom has a recipe from an old Betty Crocker cookbook that makes the best apple pie that I have ever tasted. Apple rhubarb pie, with a crumb topping - definitely. All this pie talk is getting me in the mood for the great pie holiday - thanksgiving! I LOVE apple pie with crumb topping and lemon meringue, I can't pick a favorite between those two. grasshopper (mint chocolate) or coconut creme. Mmmmm....mincemeat. And my husband hates it, which means I HAVE to eat a lot of pie. Tough job, but I do it! Pear Gruyere Pie - My own invention based on the late great TV show all about pie, Pushing Daisies! It's like apple, but so light and tasty. I'm a pie lover, so it's hard to choose just 1 favorite, but I guess it would have to be blackberry pie. Chocolate Raspberry Pecan Custard Pie -- the pie that came to me in a dream and is now my birthday not-cake of choice. old school apple pie right hot out of the oven... i would definitely risk a burnt tongue for this pie. My grandmother made coconut creme pie that was so wonderful ... she never even used a recipe. How I wish she had written it down now, she's been gone for 13 years, I miss her and her wonderful cooking. French Silk...in fact I'm in need of a good recipe for this! YUM! What a great give away! I love making pies...my favorites are blueberry and butterscotch yum! Pecan pie without a doubt. Apple! Hope you feel better soon! My husband is the pie-maker in our house and I love his homemade chocolate cream pie! My absolute favorite is Pumpkin. My grandma's chocolate pie! I look forward to it every Thanksgiving! That is a very pretty pie plate. my dad's Royal Pecan Pie! prize winning and delicious! Apple cranberry pie is my favorite! My favorite is definitely Strawberry Rhubarb with a crumb topping, second best would have to be Pear though. Just one?! It would have to be my Grandma's Banana Cream Pie!!! Thanks for the giveaway! Peanut Butter Mousse Pie. YUMMY!!! I love apple pie! I have been having pregnancy cravings for a really good warm one for a week. I would have to say any type of chooclate pie is my favorite cold pie. As for hot pies, my favorite is probably pumpkin. My favorite is lemon meringue. I love the sour taste! Pumpkin pie with whipped topping is a close second though. Derby Pie - good old fashioned Ky staple. What's not to love with Carmel, pecans, chocolate chips and all the ooey gooey yummyness that is Derby pie? Cherry or classic apple pie, a great vanilla ice cream is a definite must! I think pecan would be my absolute fav pie.